Memphis 85 Texas 67, any questions? The Memphis Tigers are in the Final Four and no one is playing better. Two days after running Tom Izzo and the Michigan State Spartans out of the gym, Memphis followed up with an even more resounding victory over the second seeded Texas Longhorns. 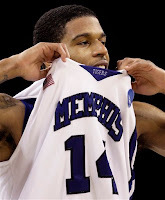 Led by super-freshman Derrick Rose, Memphis answered all critics by going a combined 30 of 36 at the free throw line. More importantly their tough defense shut down Texas guard D.J. Augustin, who some consider the best guard in the country, forcing Augustin to go 4 of 18 from the floor. Memphis' performance against Texas can be described in three words, bigger, stronger, faster. Junior guard, Chris Douglas-Roberts is 6'7 and freshman guard Derrick Rose is 6'3, and they play like it smothering opponents from the tip to the finish. On Friday night the Memphis Tigers were up THIRTY, yes THIRTY points against Michigan State at the half, yesterday afternoon their 11 point lead was pushed to 18 by the end of the contest. John Calipari has these kids playing the underdog card which has led to not one but two blow out victories after they reached the field of 16, no team has looked stronger. Next up for CDR & Derrick Rose, the UCLA tandem of Darren Collison & Russell Westbrook. By now you know the dream season of Davidson has ended at the hands of Bill Self and the Kansas Jayhawks. For everyone outside of Davidson, North Carolina we didn't expect them to put up the fight they did against what most of us consider the strongest team in the nation, but they did. Credit has to be given to the Kansas defense which fought through screens and made sure Curry had a hand in his face every time he touched the ball, the last play of the game was a prime example. Curry was forced into passing the ball off and Davidson couldn't keep their slipper on. On a day where we expected Kansas to show us why they could beat North Carolina next week, nothing could be further from that. If Kansas plans to win a national championship this year they will need much more than 16 points and 12 rebounds COMBINED from their front court of Darnell Jackson and Darrell Arthur. Sorry Bruins, so that last comment was a bit of a cheap shot because they beat my tournament sleeper. In all honesty has UCLA beaten anyone that we should really be impressed by? Xavier is a good quality team with senior leadership but I'm not sure that win justifies their games against Mississippi Valley State, Texas A&M (6Th in the Big 12, 25-11), and near loss to Western Kentucky. I'm making you four, so surprise me. Kansas may be in the same category as UCLA, wins against Davidson, Villanova, UNLV, and Portland State aren't exactly numbing. Consider that UNLV, an eight seed, is the highest seed they beat and the only seed lower than 10. Even still Bill Self hasn't lost a game since February 23rd and has the most physically imposing team still alive in the tournament. Carolina is finally leaving the state of North Carolina to play in a tournament game and it is the National Semifinal game. Without the hoards of Carolina fans wearing their Carolina blue and yelling at the refs it will be interesting to see them play a Kansas team whose bigger front court and comparable back court could bring some big problems their way. The Tar Heel win over Louisville validated them in some way and I think it could propel this teams momentum all the way to San Antonio. Memphis, who SHOULD have been awarded the #1 seed overall in the entire tournament, arrives in San Antonio with a chip on their shoulder and playing better than anyone. They played in the only region where chalk held up and a 1 & 2 met in the regional final, that was after they crushed Michigan State 92-74. Defeating Mississippi State (2nd in the SEC), Michigan State (27-9, beat Texas) and finally Texas (31-7, second in the Big 12) would validate Memphis' tournament run. Not to mention, because I've done it 12,000 times already, their tough non conference schedule. Lastly, Shawn Taggert, the 6'10" sophomore forward who came off the bench for 18 minutes scored 12 points, hit his free throws, and MOST IMPORTANTLY USED HIS 5 FOULS. If your going to come off the bench, use your fouls and make the other team work for their points, one of the most underrated things in basketball. Memphis was looked over as the overall #1, even though they came within a jump shot away from having an undefeated regular season, they were placed in what was considered the toughest region and if they made it to the Elite 8, they'd play Texas in TEXAS, and what did they do? Smash opponents. BRING ON THE HEELS!